Valérie Debuiche, « A response : Leibniz’s Principle of (Sufficient) Reason and Principle of Identity of Indiscernibles », in J. Stetter and Ch. Ramond (eds. 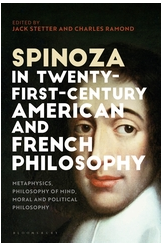 ), Spinoza in Twenty-First-Century American and French Philosophy, London, Bloomsbury Academic, 2019, p. 144-154.